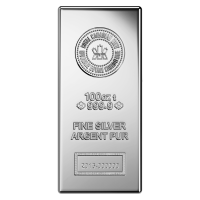 Purchase your 2 oz 2018 Perth mint lunar year of the dog silver coin today from our store at the most competitive price online. This striking edition forms part of the ever popular lunar series II from Perth mint, the first release of which was minted in 2008. The coin’s reverse bears a crisp image of the trustworthy and beloved German Shepherd dog breed, together with the Chinese character for ‘dog’ and the title, ‘Year of the Dog.’ The relief shows a mother dog lying in a field of grass with her adorable puppy and also includes an age old Chinese symbol of good fortune, the peony flower. The obverse relief is that of Ian Rank-Broadley’s striking likeness of Her Majesty Elizabeth II and is framed by the coin’s weight and purity, face value and year of issue. 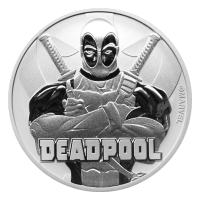 The coin’s overall design, which is clean lined and startlingly beautiful, is only part of the reason that this series and its predecessor enjoy such widespread popularity. 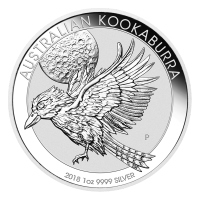 The Perth Mint’s Lunar Series I, which began in 1996 and Lunar Series II, which began in 2008, celebrate the animals of the ancient Chinese lunar calendar and these coins are sought after not only as ideal gifts for loved ones but also as potential investments. 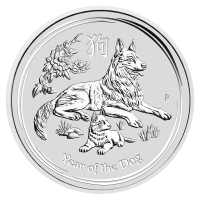 The 2 oz 2018 Perth mint lunar year of the dog silver coin is the perfect way to celebrate the steadfast loyalty and companionship of ‘man’s best friend’ today. Obverse Effigy of Queen Elizabeth II with the words "Elizabeth II Australia 2 Dollars 2 oz 999 Silver 2018"
Effigy of Queen Elizabeth II with the words "Elizabeth II Australia 2 Dollars 2 oz 999 Silver 2018"
2 oz 2018 Perth Mint Lunar Year of the Dog Silver Coin Purchase your 2 oz 2018 Perth mint lunar year of the dog silver coin today from our store at the most competitive price online. 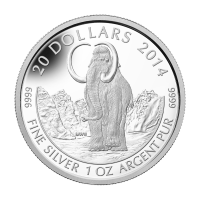 This striking edition forms part of the ever popular lunar series II from Perth mint, the first release of which was minted in 2008. The coin’s reverse bears a crisp image of the trustworthy and beloved German Shepherd dog breed, together with the Chinese character for ‘dog’ and the title, ‘Year of the Dog.’ The relief shows a mother dog lying in a field of grass with her adorable puppy and also includes an age old Chinese symbol of good fortune, the peony flower. The obverse relief is that of Ian Rank-Broadley’s striking likeness of Her Majesty Elizabeth II and is framed by the coin’s weight and purity, face value and year of issue. 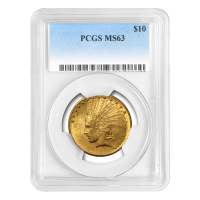 The coin’s overall design, which is clean lined and startlingly beautiful, is only part of the reason that this series and its predecessor enjoy such widespread popularity. 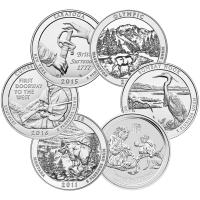 The Perth Mint’s Lunar Series I, which began in 1996 and Lunar Series II, which began in 2008, celebrate the animals of the ancient Chinese lunar calendar and these coins are sought after not only as ideal gifts for loved ones but also as potential investments. 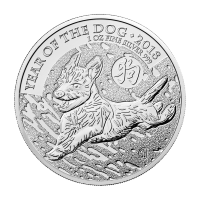 The 2 oz 2018 Perth mint lunar year of the dog silver coin is the perfect way to celebrate the steadfast loyalty and companionship of ‘man’s best friend’ today.